The leaders of India and Pakistan have said that peace between the two nuclear rivals is "irreversible". Manmohan Singh and Pervez Musharraf were speaking after signing a joint statement that followed peace talks in the Indian capital, Delhi. They have also agreed to increase trade and transport links between Indian- and Pakistani-administered Kashmir aimed at solving the long-running dispute. The two sides embarked on a peace process in January last year. President Musharraf left India for the Philippines after calling on former Indian Prime Minister, Atal Behari Vajpayee. Indian and Pakistani officials worked late into the night to finalise the text of the statement that was released by the leaders on Monday. Both sides also pledged not to let militant attacks impede the peace process. "[We are] conscious of the historic opportunity created by the improved environment in relations and the overwhelming desire of the peoples of the two countries for durable peace," Prime Minister Manmohan Singh said. Earlier, President Musharraf said the talks had been more successful than he had expected. He said the Kashmir dispute would have to be solved amicably. But he added that the Line of Control dividing Kashmir could not be accepted as a final solution to the dispute over the region. India and Pakistan have gone to war twice over Kashmir, a territory which both sides claim. Speaking to Indian editors over breakfast on Monday, President Musharraf said military solutions were "not the option anymore". "The world has changed, especially after 9/11," he said. He also said only the leaders of the two countries, rather than diplomats and officials, could find a solution to Kashmir. On Sunday, President Musharraf met separatist leaders from Indian-administered Kashmir. "We support the measures, but we believe this is an incomplete process," separatist leader Mirwaiz Omar Farooq told journalists after the meeting. The separatists have said they want to be included in the peace process. Militant groups fighing Indian rule in Kashmir accused President Musharraf of selling out and betraying Muslims in the territory. Also on Sunday, the two leaders watched the start of the final one-day international cricket match between India and Pakistan. The match was eventually won by Pakistan. Mr Singh presented the president with a painting of his childhood home in Delhi. 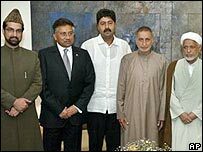 In turn, President Musharraf gave the Indian prime minister a copy of his birth certificate and photographs from the village in Pakistan where he was born. It was President Musharraf's first visit to India since a failed summit in 2001. The trip followed a year of peace talks, which the week before last saw the first buses in nearly 60 years cross divided Kashmir.